Great power and versatility to make your dream rack-based rig. Mission EmPower Technology features multi-channel class D power amplifiers, active crossovers with variable EQ, and full range co-axial drivers, all designed from the ground up to work together as the perfect amplification solution for modeling systems. Gemini 1 features a 110W internal amplifier, 12³ low-frequency driver, and 1³ coaxial high-frequency driver providing a frequency range from 57Hz - 20KHz. Pro-audio ¼" jack and XLR connectors, USB, and optional stereo Bluetooth wireless interfaces connect Gemini amps directly with software based guitar systems on computers, tablets and smartphones, as well as dedicated guitar processors. The studio quality onboard digital audio interface features bit perfect class 2 stereo audio with, selectable sampling rates up to 192KHz and 24bit. This allows you to play and record directly into your PC or Mac without any additional hardware. The EmPower EQ control allows blending between a flat or a more traditional guitar cab frequency response. Gemini can be used as a flat frequency response power amp and speaker, or as an onstage monitor with a more traditional guitar cab frequency response. Full range flat response (FRFR) systems can often sound harsh and brittle when used as a monitor compared to a traditional tube amp. Empower allows you to dial in just the right blend depending on your application. Gemini can also be miked up like a traditional speaker cab. Sophisticated connectivity supports a multitude of different input and output options via Combo XLR-/1/4³ jack, and USB inputs. With a single Gemini 1, stereo inputs are summed into a mono signal and output through the internal speaker drivers. Add a second Gemini 1, and PresenceDetect automatically determines the master/slave configuration and routes the stereo signals to the appropriate left and right Gemini units. Multiple inputs are mixed so you can connect a guitar and a USB device simultaneously to play along with a recording. Gemini's advanced power system provides a number of benefits not found in traditional guitar amplifiers. 100 - 240 input voltage and 50/60 Hz compatibility means you can use Gemini almost anywhere in the world without requiring heavy and expensive transformers. Just connect directly to wall power wherever you are with a suitable cable. Power saving features such as a high efficiency power supply and deep sleep modes for internal components mean Mission Gemini's use a fraction of the power of a regular amp, costing less to run, and wasting less energy. The included V-Lock power cable ensures the power is correctly connected, and protects against the cable being accidentally pulled out. The Gemini 1 will grace any stage or studio. Each cabinet is hand made from 3/4³ void free, baltic birch with a high quality black Tolex covering, black basket weave acoustic speaker covering, and chrome hardware. "The cabinet produces great tones almost as soon as it is fired up. When I used it to jam with some friends before even starting the review, I was digging it and feeling goose bumps on my arms from the organic, punchy, and ferocious guitar tones it translated from the Kemper. Wow. One of the first things that struck me about this cab was the comparison of let's say, paper or plastic? My PA wedges sounded a bit plastic with the Kemper probably due to the horn design and in comparison the Mission cab had a more paper sound, now to me that is what a guitar cab should sound like, softer and more natural. Oh yeah, it has power, and in spades. The Gemini 1 gets as loud as you need it to be without hissing, crackling, or any other audible gremlins. This thing can roast your pant legs off! Its biggest secret however is the single EmPower EQ knob that tailors the sound between "full range flat response" reproducing and a darker, more realistic, "tube-amp-like" guitar-cabinet tone. Thanks to the EmPower EQ, I could get my rig dialled up and sounding great in about ten seconds. Really." The top 2U space is open as standard to fit most modeling amps and effects units. The 16³ depth comfortably accommodates full length devices. A 2U blank in the bottom space is finished with quality black grill cloth, and silver trim to match the Gemini cabinets for a boutique half stack appearance. The blank can be removed to access the additional 2U of rack space when required. Gemini H is made in the USA from rugged, void free 3/4³ birch ply. Black Tolex covering and chrome hardware perfectly match the Gemini cabinets, and also look great with other cabs. 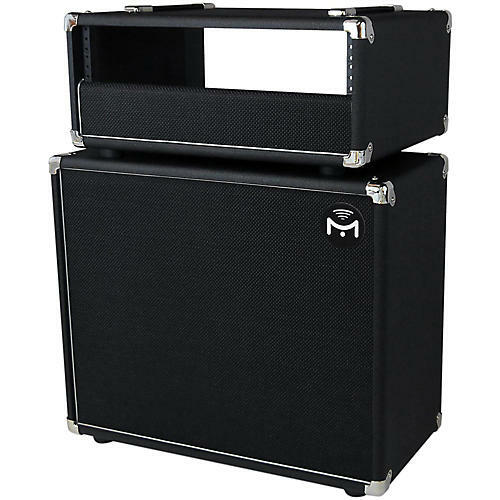 Each unit comes fully assembled with carry handles, 2U blank with cloth covering, silver piping, and four sturdy rubber feet allowing the head to sit on top of a speaker cab, flight case, or studio table. A screw kit is included for securing your equipment into the rack. The short version is 12³ deep to match the depth of the Gemini 1 and 2 cabinets. The Short Head will accommodate rack units such as the Kemper Profiler and Avid Eleven Rack. The Full Head is 16³ deep to accommodate full size units such as the Fractal Audio Axe-Fx.